ANNAPOLIS, MD (November 1, 2015) – No, we are not talking about indiscretions by European aristocrats. 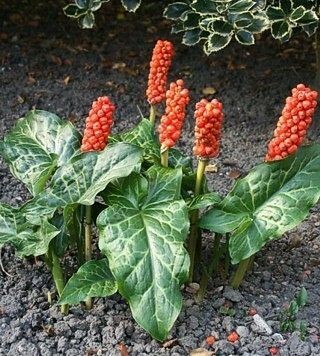 Our misbehaving "lords and ladies" are errant populations of Arum italicum, whose common names include "Italian arum," "orange candleflower," "cuckoo's pint," as well as "Italian lords-and-ladies." Like many of our invasive plants, Arum italicum (and particularly its heavily-variegated cultivar known variously as Arum italicum subsp. 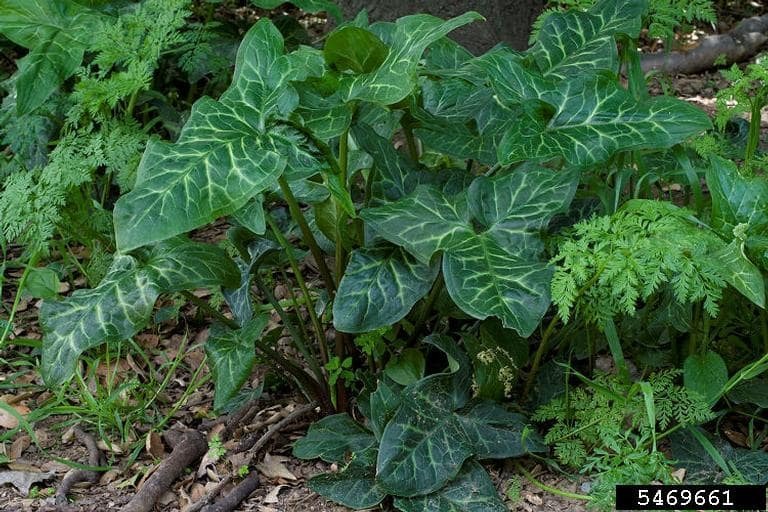 italicum 'Marmoratum' or Arum italicum 'Pictum') is sold and planted as an ornamental. This perennial has a special appeal to homeowners in the mid-Atlantic because it puts out its leaves in the fall for a winter display. Once the temperature heats up, the leaves disappear, replaced by a spike of red-orange berries in late summer. Because it is easy to identify in the fall and difficult to control, Arum italicum has been named the November's "Invader of the Month". Both the spring flower and the summer berries have a resemblance to that of our jack-in-the-pulpit (Arisaema triphyllum). Animals and birds that eat the berries are probably the chief method of dispersal from the home landscape to natural areas. It is thought that it may also be spread by improper disposal of the corms (tuber-like underground stems) from which it grows. Arum italicum prefers moist, shady spots, although it likes winter sun. It grows about 12 to 18 inches high and forms a gradually increasing clump. It has become invasive in areas along the U.S. west coast and in the mid-Atlantic. Invasive populations have been found in Maryland's Montgomery County, as well as in nearby northern Virginia and in Washington D.C.'s Rock Creek Park and National Arboretum. No effective control of Arum italicum has been found as it is difficult to remove all the underground corms, and herbicides are largely ineffective. Should you attempt manual control by digging, try to remove all the corms and be certain to bag them. Do not put the corms in compost. Instead of buying the invasive Arum italicum, try the native plant "toothwort," (Cardamine diphylla, previously Dentaria diphylla) for moist shady spots. Like Arum italicum, the 10-inch tall toothwort displays leaves with showy white veining in the winter and goes dormant in summer. Toothwort also sports lovely white or pink flowers in the spring, and it is a host plant for the caterpillars of the increasingly rare West Virginia white butterfly (Pieris virginiensis).